The new Audi A8 presents the future of the luxury class. In its fourth generation, the brand’s flagship model again provides the benchmark for “Vorsprung durch Technik” – with a new design language, an innovative touchscreen operating concept and a systematically electrified drive. The Audi A8 is also the first production automobile in the world to have been developed for conditionally automated driving. 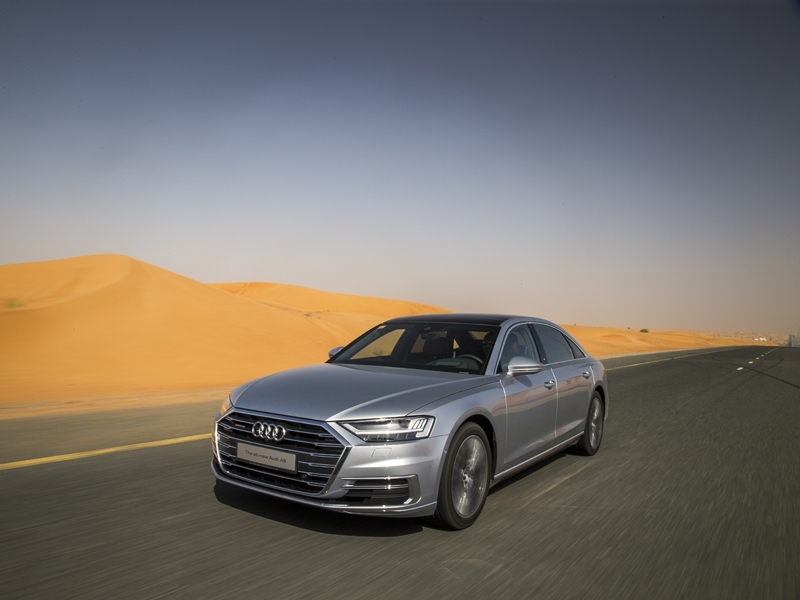 Audi will gradually be taking piloted driving functions such as parking pilot, garage pilot and traffic jam pilot into production for the Middle East market once the legislation has been validated. Sporty elegance, sophistication and progressive status – the exterior design of the Audi A8 marks the start of a new era for the entire brand. The front with its broad, upright Singleframe grille, the flowing and muscular body design and the rear with its full-length light strip radiate a powerful presence – in the 5.17 meter long normal version as well as in the A8 L with its 13 centimeter longer wheelbase. The new A8 is 1.95 meters wide and 1.47 meters tall (1.49 meters in the case of the A8 L). The progressive character of the new Audi flagship becomes especially clear in the side view. The flat roof dome lends the sedan a sporty touch, while stretched lines underscore its length. The upright front end combined with the gently inclined rear creates visual excitement. The proportions equally highlight the front and rear wheels, while subdued muscularity via the wheel arches signifies the quattro drive. The lighting is also state-of-the-art, especially in the top-of-the line version with HD Matrix LED headlights including Audi laser light and rear lamps with OLED technology. The result is a dynamic light show as the driver approaches and leaves the car. The body of the new A8 follows the Audi Space Frame principle. The body consists 58 percent of aluminum parts, whose strength has significantly increased compared with the predecessor model. The cabin consists of hot-formed steel components, complemented by an ultra-high-strength, torsionally extremely rigid rear panel made of carbon fiber-reinforced polymer. A magnesium strut-tower bar completes the lightweight construction concept. With its combination of four different materials, the luxury sedan embodies a new level of multi-material design, to the customer’s direct benefit – and not just in terms of weight reduction. The superior rigidity of the body provides the foundation for the precise handling, the excellent ride comfort and the acoustic tranquility on board. The interior of the A8 resembles a lavish, spacious lounge. Compared to the predecessor model, it has grown in length by 32 millimeters in both body versions. The interior has been deliberately reduced in form, and its architecture oriented strictly horizontally. In darkness, contour and ambient lighting elegantly outlines the striking design lines. New for the rear compartment are precisely controllable Matrix LED reading lights. The range of equipment and materials is extensive, with every detail radiating superlative bespoke quality – from the perforation in the seat upholstery to the electrically opening and closing decorative shutters on the air vents and the satiny leather of the comfort head restraints. The most elegant place in the new Audi flagship is the rear right-hand seat – this is the optionally available relaxation seat in the A8 L and features many options for adjustment as well as a footrest on the backrest of the front-passenger seat. Here, passengers can massage and warm the soles of their feet in several levels. Included in the relaxation seat package are a back massage feature, electrically height-adjustable comfort head restraints, footrests, a long center console and, as optional features, folding tables with two-stage adjustable inclination, , the Rear Seat Entertainment system comprising two Audi tablets, and the Rear Seat Remote. Rear-seat passengers can use the touch control on this new operating unit to run numerous convenience and infotainment features as well as make discreet phone calls. The Rear Seat Remote with its OLED display is approximately as big as a smartphone and can be removed from where it is stored in the center armrest. V6 turbo engine: 3.0 TFSI, the A8 55 TFSI (combined fuel consumption in l/100 km: 7.8 - 7.5; combined CO2 emissions in g/km: 178 – 171, 250 kW (340 hp). The new Audi A8 will, for the first time, be equipped with an electrified drivetrain as standard. The engines are equipped for this purpose with mild-hybrid technology: a belt alternator starter (BAS) and a lithium-ion battery with 10 Ah electrical capacity. The new A8 can then coast at speeds between 55 and 160 km/h with the engine off. As a result, the vehicle can then travel with zero emissions for up to 40 seconds. As soon as the driver steps on the gas again, the BAS prompts a swift, very smooth restart. The new 48-volt system, which in the new A8 functions for the first time as a main vehicle electrical system, allows a high recuperation power of up to 12 kW plus start-stop operation from 22 km/h. The combined effect of these measures is to bring down the fuel consumption by as much as 0.7 liters per 100 kilometers in customer operation. All engines operate in conjunction with a fast and gently shifting eight-stage tiptronic. The latter combines an rpm-adaptive torsion damper allowing low engine speeds, as well as a new electrical oil pump for changing gears while coasting. The quattro permanent all-wheel drive system with self-locking center differential is standard and, in the case of all MHEV model variants, it can be supplemented by the optional sport differential. It actively distributes the drive torque between the rear wheels depending on where it is needed, for even sportier driving and more stable handling.